From earliest times - the emergence of France & Germany out of the post-Roman world - right through the story of the 20th century, from World War I to the Cold War. 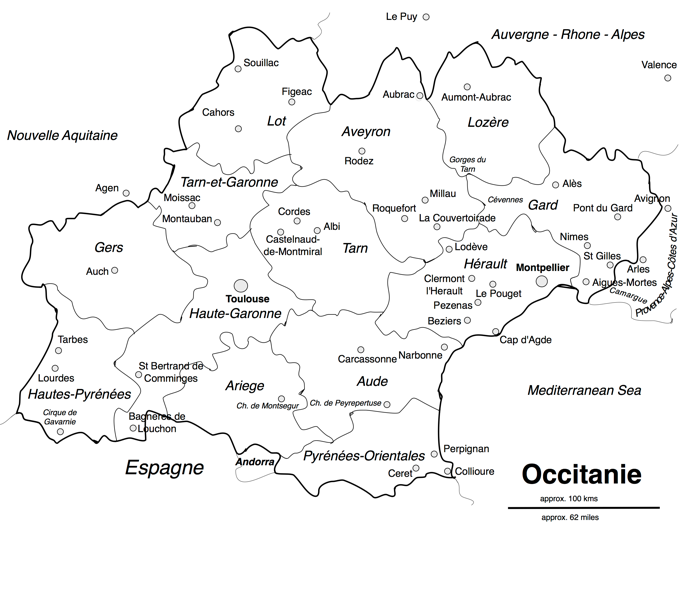 The new ‘mega region’ of Occitanie includes the regions of Languedoc - vineyards, medieval villages, Mediterranean coast, limestone Causse scenery - and Midi-Pyrénées: stunning architecture (the Romanesque cathedral in Toulouse; the 21st-century Millau Viaduct spanning an entire valley), high-tech (the A380 Airbus plant in Toulouse) & Pyrenean scenery. • We arrange itineraries, hotels, transport, site entries and provide personal guiding. We delivery quality personal service. Start at a hotel in Montpellier at 9 a.m. Walking tour of the city centre - the Place de la Comédie, the Esplanade walk, then into the pedestrian streets of the Old Town. Coffee stop before finishing at the Peyrou gardens and viewpoint. Then we’ll drive to the Antigone development of the 1980s and 1990s on the edge of the downtown - a post-Modernist extravaganza. Drive 35 minutes to the 1960s Mediterranean resort of La Grande Motte: sea front walk & time for lunch. 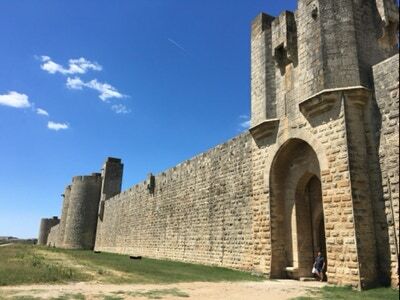 Then we go a further 15 minutes to the 13th-century walled town of Aigues-Mortes on the edge of the Camargue region: walk on the walls and climb the Tour de Constance, ice cream / coffee in the Place St Louis and a look inside the Church from which King Louis IX set off on the Crusades. Free time, then 45 minutes back to Montpellier for the night. 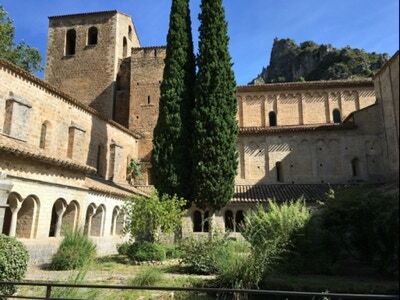 Drive 50 minutes to the village of St Guilhem-le-Désert: set in a steep valley at the edge of the rugged mountains, with a Romanesque abbey church and cloisters. Afterwards, 25 minutes south for lunch in a small village set in the vineyards of the Hérault region. 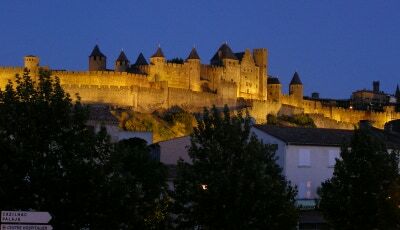 Then drive 1 hr 30 minutes west to the medieval walled city of Carcassonne: introductory walk, and hotel for the night. Until 10.30 a.m. in Carcassonne - free time, opportunity to go into the Castle, etc. Drive 1 hr 35 minutes to the Chateau de la Peyrepertuse - hilltop Cathar castle that held out against the Albigensian Crusades until 1241. Short steep walk up into the castle ruins for those that want. After 2 hours on site we’ll head back 2 hours 45 minutes to Montpellier, making a stop in the bustling sea port of Sète on the way. Montpellier is 3 hours 20 minutes by TGV from Paris Gare de Lyon. It is served by daily flights from London Gatwick by Easy Jet; Ryan Air fly to Béziers and to Carcassonne. Prime city of the ‘bridge’ region between the Mediterranean and the Atlantic at Bordeaux since Roman times, Toulouse is a dynamic city of 500,000, a university town and French capital of aeronautics. Known as La Ville Rose in view of its profusion of brick buildings - fine mansions from the 16th and 17th centuries in particular. Walking tour of the city taking in the Garonne river; St Saturnin, the brick Romanesque cathedral, consecrated in 1096; the busy main square, La Capitole; l’hôtel d’Assézat, one of the finest 16th-century private mansions (coffee or lunch pause here), and the Musée des Augustins in a 14th-century monastery. After lunch we drive out to the Airbus manufacturing plant for a tour of the A380 assembly line. 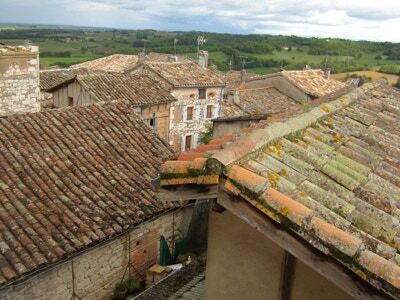 Then we’ll drive one hour north-west to cross the Tarn to stay in the hilltop bastide town of Castelnau-de-Montmirail. 30 minute drive to Albi for time in this town on the banks of the Tarn: cathedral (huge brick 14th-century construction), Toulouse-Lautrec museum in the adjacent Bishop’s Palace (this was T-L’s home town), mediaval side-streets. After lunch we drive to the small village of Roquefort-sur-Soulzon - tour of the famous blue cheese factory. 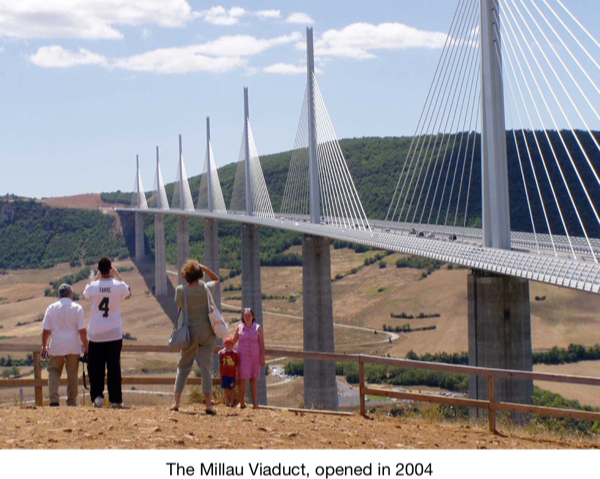 Then we’re going to drive under the Millau Viaduct (we’ll stop at some good viewpoints) on our 30-minute journey to Millau where we’re spending the night. A drive north out of Millau upstream along the Tarn to see the famous Gorges du Tarn, making several stops for views and coffee. The highlight will be the Point Sublime high above the valley, from which we’ll head to the autoroute 25 minutes away. Lunch stop before driving 1 hour 20 minutes south to St Guilhem-le-Désert. 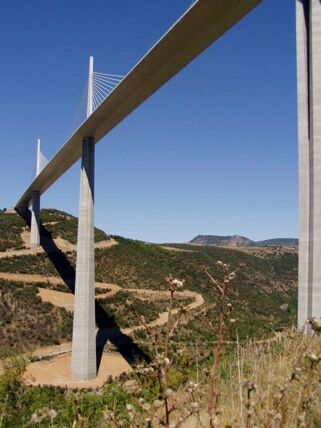 This takes us across the stunning Millau Viaduct - we’ll make a stop at the viewpoint (short walk). To St Guilhem, set in a steep valley at the edge of the rugged mountains near the Hérault vineyards, with a Romanesque abbey church and cloisters. Walking tour and free time (there is a marvellous walk up the valley walls for the adventurous) - night in hotel here. 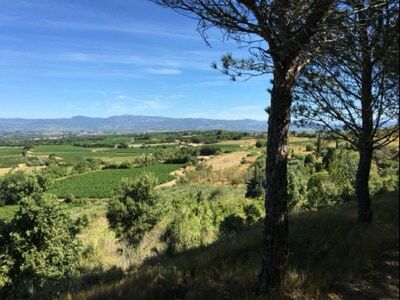 We’ll drive through the vineyards of the Hérault - coffee stop in a village - before our 50 minute journey into Montpellier. Walking tour of the city centre - the Place de la Comédie, the Esplanade walk, then into the pedestrian streets of the Old Town. Finish early afternoon with either dropping you at the airport or at the train station. Toulouse is 6 hours by train from Paris - which will be reduced when the TGV extension from Tours to Bordeaux opens in 2017. It is served by daily flights from London Luton, Heathrow & Standstead, & Bristol in season. Montpellier is 3 hours 20 minutes by TGV from Paris Gare de Lyon and is served by daily flights from London Gatwick.